Short-Term – (2 hour maximum.). Permits are not valid. General – (minimum 2 hours) general parking for students, employees, and visitors: licence plate registration required by e-permit, pay station, mobile app, etc. Economy – economy parking for employee, student and visitors: licence plate registration required by e-permit, pay station, mobile app, etc; first-come, first parked. Any vehicle parked in an Employee-Only lot with licence plate not properly registered with an employee e-permit will be subject to immediate tow away at owner’s expense. Short-Term – (2 hour maximum.). E-Permits are not valid. lot G–adjacent to the Art Gallery (bldg. 330). lot H– behind the Day Care (bldg. 335). lot I–off Fifth Street, in front of building 350, upper and lower stalls. lot F – Lower Level. lot R–adjacent to the Lower Cafeteria (bldg. 185). 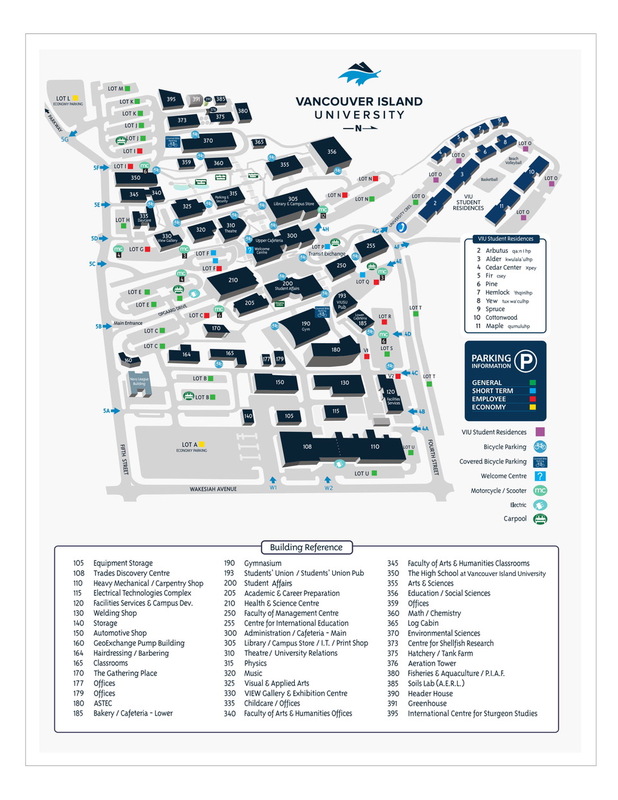 lot V–on the North side of the Applied Programs Building (bldg. 180) and on the East side of Facilities Services (bldg. 120). Employees without e-permits can park in General lots by purchasing a pay station ticket at a rate of $8 per 12 hours. Upper Lot F , in front of Building 300, is a short-term metered parking (max. 2 hours). E-Permits are not valid in this lot. E-Permits are not valid when parked in a Short Term Lot. Pay Station tickets from the General Lots are not valid in Employee Only lots, except after 5pm Monday to Friday and all day on weekends and holidays. Any vehicle parked in an Employee–Only lot with licence plate not properly registered with an employee e-permit will be subject to immediate tow away at owner’s expense. lot B–off Fifth Street, below building 164.
lot C–off Opgaard Way, adjacent to Career and Academic Preparation (bldg 205). lot J–off Fifth Street, at the top of the campus. lot K–off Fifth Street, at the top of the campus. lot N–Lower north and south end. lot S–adjacent to building 181.
lot T–along Fourth Street where parking is allowed. lot U–at lower campus, off Wakesiah and Fourth Streets. Students may not park in the Employee Lots. Students may not park in parking stalls that have been designated as special purpose spots. Upper lot F–adjacent to bldg. 300. (existing metered lot). lot C–(designated parking stalls for Hairdressing appointments only). Drivers must also display a hair dressing permit. See receptionist in Building 164. Two Metered stalls. Lot J– One Metered stall. Visitors may also park in any GENERAL Lot, if their stay on campus will be longer than 2 hours. Purchase a ticket from the General lot pay station for the number of hours you require to park. Maximum cost is $8 per 12 hrs. There are marked parking stalls for people with disabilities in most parking lots. Parking in fire lanes or loading zones is NOT permitted with this type of permit, however, may be used for drop off purposes. The vehicle may not be left unattended in these areas. To park in designated disabled parking stalls, the vehicle MUST be visibly displaying a valid Independent Living permit. If no permit is visible, a parking violation will be issued and the vehicle is subject to be towed at the owner’s expense. People with a documented disability and displaying their permit may pay on a voluntary basis for parking. Vancouver Island University does NOT issue special permits for persons with disabilities. However, special permits are available locally from Nanaimo and Region Disability Resource Centre #2 – 4166 Departure Bay Road. Tel. 250-758-5547. The Disability Services Office in bldg. # 200 has a supply of application forms and information regarding this organization. Persons with a documented disability who display a valid special permit–available from Nanaimo and Region Disability Resource Centre–can park in any designated parking stall, including those in Employees-Only lots when designated Disabled Parking is not available or not convenient. Loading zones are for loading and unloading only. Vehicles may be stopped in these areas for a maximum of 30 minutes. Where loading zones are not available, vehicles may stop in non-standard location upon consulting with the Parking/Security Office. Vehicles loading and unloading must leave their emergency flashers on, and if possible, leave a note indicating which building, which room they will be in and a cell phone number to contact a driver. In emergency situations, Facility Services must be able to contact drivers to move their vehicle. Fire Lanes are for emergency and service vehicles only. Unauthorized vehicles left unattended in the fire lanes will be towed and receive a parking violation. The speed limit on campus roadways is 20 kph, Unless otherwise posted.